This article is about the Oblivion gates. For the realms of Oblivion (inside the gates), see Planes of Oblivion. Oblivion Gates are portals that are opened by the forces of Oblivion, acting as bridges between the Mortal plane (Mundus) and the Daedric planes. They are easily visible with their surrounding ring of fire, especially at night. Also, just in case you missed their presence, passing near one will normally make the sky turn ominously red. Nearby gates will appear on your compass; if you approach near enough to the gate, a marker will be permanently added to your map (the marker remains present even if you close the gate). Initially, only one Oblivion Gate exists in the game, in front of the main gate of Kvatch. As you advance through the Main Quest, more and more gates will appear. There are a few locations where gates will always appear; in addition, there are a large number of randomly appearing gates. Completing the Main Quest will make all existing gates close and no more will open. Closing an individual gate can only be accomplished by locating and removing the Sigil Stone that powers the gate. This Sigil Stone is found in the Sigillum Sanguis at the top of the main tower within the associated Plane of Oblivion the gate leads to. Once removed, the Sigil Stone can then be used to enchant one item. Although sometimes there are many towers, the main tower is always easily distinguishable by the blood red windows on its top floor. The appearance of an Oblivion Gate generally triggers additional changes in the surrounding landscape. 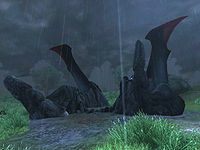 Bloodgrass and Harrada may be found near the gate; architectural features such as spikes and bridges that are normally only found in the Planes of Oblivion may appear. Probably of more immediate interest to your character are the creatures that come through the gate from Oblivion. Near each gate you will find one to four leveled Daedra. If you are planning to enter the gate, it is probably worth spending the time killing off these Daedra before entering. Otherwise, you will be forced to face them after you close the gate; they will not magically disappear along with it. Before venturing into the realm of Oblivion, make sure that your armor and weapons are in top condition and that you're well equipped with lots of potions, arrows, repair hammers, soul gems, and even a backup weapon if necessary (this is especially advised if you use a magic weapon and have not yet reached Journeyman level in Armorer). It is generally possible to return back through the gate to resupply yourself, but this is time consuming and there are some Oblivion worlds where it becomes impossible to return to the gate. After you have closed a gate, its charred wreckage will remain, permanently blighting the landscape. Any Bloodgrass or Harrada that took root near the gate will remain present, which can provide a useful source of ingredients after you have finished the main quest. Two Oblivion Gates form on top of Wayshrines, destroying most of the shrine. Both of these gates are fixed gates that always open as soon as the Dagon Shrine quest has been completed. The Wayshrines article provides details on the affected shrines. There are different approaches to take with the Oblivion Gates. You may wish to close each gate as you encounter it. This is particularly useful if you want to collect Sigil Stones and gain Fame. Entering a gate early will allow you to battle easier Daedra (the Daedra are all leveled, based upon your level at the moment you enter the gate). This might allow you to quickly get the gate closed. If you wait, you will find increasingly harder opponents and more valuable loot until both cap at level 24. Sigil Stones found after level 17 will give up to twice the power of enchantments made at an altar of enchanting. You gain one or two points of Fame, but usually one. Dremora found inside have a good chance of carrying powerful rings and amulets. Many Daedra carry valuable alchemical ingredients that are good for strong, useful potions. There are no penalties for not closing a gate, so if the above does not look tempting, you can safely ignore all of the random gates. One Master Training quest, namely Mysticism training with Dagail, requires you to close three gates, but this is possible even if you close the minimum number of gates necessary to complete the Main Quest. If you have closed 60 Oblivion Gates, you have closed them all (this includes 50 random gates, 9 standard gates, and the Great Gate). Since no gates reopen (unless you use the console to change the default game settings), no more Oblivion Gates will appear. There are actually a total of 100 fixed locations where gates may open. At 10 locations this will always happen, and for 90 locations this is random. However, no more than 60 gates will open during the course of playing the game. The article on 100% Completion provides tips for players who want to ensure that their accomplishment page states that 60 gates have been closed. 1: The gate in front of Kvatch (see map), leads to the Kvatch Oblivion World. 2: The gate by Cheydinhal (see map), leads to the Cheydinhal Oblivion World. See The Wayward Knight for details. 3: The gate by Fort Sutch (see map), leads to one of four random worlds (2, 3, 4, or 7). See Attack on Fort Sutch for details. 4: The gate by Anvil (see map), leads to Random Oblivion World 7. 5: The gate by Chorrol (see map), leads to Random Oblivion World 2. 6: The gate by Leyawiin (see map), leads to Random Oblivion World 3. 7: The gate by Skingrad (see map), leads to Random Oblivion World 4. 8: The gate by Bravil (see map), leads to Random Oblivion World 1. 9: The gate by Bruma (see map), leads to the Bruma Oblivion World. The Great Gate that also appears outside Bruma, leads to the Great Gate Oblivion World. Most of the gates that you will encounter during the game appear randomly. These gates will connect to one of seven randomly chosen Oblivion worlds. The number of random gates that can be open at any given time during the game is determined by how much of the Main Quest has been completed. In order to have the maximum number of gates open at a particular stage of the game, it is likely that you will need to explore and revisit several areas in order to trigger the random gates. Ten random gates immediately appear after you complete Find the Heir (i.e., once Martin is delivered to Weynon Priory). As you wander the countryside, there is a 25% chance that one of the gates listed below will appear. A maximum of 25 random gates can be open at this point in the Main Quest. When you complete Dagon Shrine, the Oblivion crisis escalates. The probability of a random gate opening increases to 50%, and the maximum number of possible random gates increases to 50. After you exit Paradise and deliver the amulet to Martin, the probability of a random gate opening reduces to 25% and the maximum number of open random gates reduces to 20. If you have closed more than 20 random gates at this point, no more will spawn. Only the fixed gate locations will be present. When the Main Quest is completed, the probability reduces to 0% with zero maximum gates. All open gates (random or fixed) are closed. There is a glitch, however, that will sometimes leave a gate open. This gate will have a fixed animation and Daedra may spawn, though you can't enter it. Map showing all 100 possible gate locations. A maximum of 50 will appear in any given game. They all have the map marker seen below. Here are the general locations of some of the gates. There are 90 possible random gate locations in all, although a maximum of 50 random gates will appear (plus the 10 fixed gates). The gates which appear in your game are selected randomly. To see the exact locations of these gates use the Oblivion map. 44: South of Bruma, where the Silver and Orange Roads meet (map). 45: Far southwest of Bruma along the Red Ring Road, slightly southwest of Piukanda (map). 46: Far south of Bruma along the Silver Road, west of Sercen (map). 47: Northwest of Bravil, slightly east of Wenyandawik (map). 48: Northwest of Bravil, slightly northwest of Wenyandawik (map). 49: Far northwest of Bravil, southwest of Nenyond Twyll (map). 50: Immediately west of the White Rose River, northwest of Fort Roebeck (map). 51: Immediately east of the White Rose River, northeast of Fort Roebeck (map). 52: Southeast of Fort Wooden Hand, northwest of Ceyatatar (map). 53: A little northwest of Fort Nikel (map). 54: A little southeast of Fort Carmala (map). 55: Immediately north of Inn of Ill Omen (map). 56: Northeast of Fort Chalman, northwest of Harm's Folly (map). 57: Northeast of Belda, east of Harm's Folly (map). 58: East of Chorrol, slightly northwest of Fort Ash (map). 59: Southeast of the Arcane University on City Isle (map). 60: Immediately northeast of Vilverin (map). 61: Northwest of Roland Jenseric's Cabin (map). 62: East of the Imperial City, southwest of Nagastani (map). 63: Southeast of the Imperial City, slightly west of Cracked Wood Cave (map). 64: Southeast of the Imperial City, south of Culotte (map). 65: North of Bravil, a little south of Fort Variela (map). 66: Far north of Bravil and a little north of Fort Variela, near the Upper Niben (map). 67: Far North of Chorrol, northeast of Lipsand Tarn (map). 68: West of Bruma, south of Rielle, slightly south of Applewatch (map). 69: East of Bruma, northwest of Sedor (map). 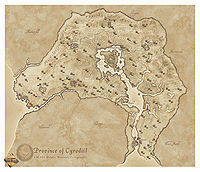 70: Far east of Bruma and due north of Cheydinhal (a short walk west of Temple of the Ancestor Moths) (map). 71: A little southeast of Sedor, slightly west of Gutted Mine (map). 72: West of Bruma, northeast of Ninendava Ruins (map). 73: A little north of Cheydinhal, slightly east of Wind Range Camp (map). 74: Southeast of Cheydinhal, near the Reed River (map). 75: Southwest of Cheydinhal, near Lake Poppad (map). 76: South of Cheydinhal, near the river fork (map). 77: South of Wenderbek Cave, almost exactly between Cracked Wood Cave and Crayfish Cave (map). 78: East of Fort Cedrian, far south of Cheydinhal (map). 79: Further south from the previous gate, between Sage Glen Hollow and Bramblepoint Cave (map). 80: Southwest of Hame (map). 81: South of Fort Facian (map). 82: East of Ondo, slightly north of Lost Boy Cavern (map). 83: South of Fort Cuptor, north of Leafrot Cave (map). 84: Southeast of Malada, northeast of Abandoned Mine (map). 85: North of Fort Sejanus (map). 86: East of Morahame (map). 87: Northeast of Cheydinhal, north of Kemen (map). 88: Northwest of Skingrad, southwest of Bleak Flats Cave (map). 89: East of Skingrad and southwest of Fort Vlastarus (map). 90: Northeast of Skingrad along the Gold Road (map). 91: Southeast of Skingrad, slightly east of Silorn (map). 92: West of Skingrad, slightly southwest of Cursed Mine (map). 93: Far northwest of Skingrad, southeast of Talwinque (map). 94: Far south of Kvatch near the Strid River (map). 95: Far southeast of Skingrad, just southwest of the Priory of the Nine (map). 96: Halfway between Skingrad and Bravil, destroying the Isolated House (map). 97: East of Nornalhorst (map). 98: Along the Gold Road west from Skingrad, slightly southwest of Fat Ramp Camp (map). 99: Due north of Skingrad, immediately west of Goblin Jim's Cave (map). The gate northwest of Fort Blueblood is labeled Mucianus Allias. The gate northeast of Ninendava is labeled Lucien Lachance. The gates related to the Allies for Bruma quest are not translated—they read "A Gate to Oblivion" instead of the usual "Tor nach Oblivion". There are several console commands that can be used to control Oblivion Gates or influence whether or not random gates open. It is possible to do this from inside the gate as well (if you still have the gate selected in the console), but this merely results in the gate (and therefore the way back) disappearing. This means that the only way to leave Oblivion World is through removing the world's Sigil Stone or closing the current gate with the command below. This will close the gate that you entered through and teleport you back to Tamriel. x is a number between 0 and 90. Setting x to 0 will prevent any new random gates from opening (but will not close any that have already opened). Setting x to 90 makes it possible for all random gate locations to open (although does not guarantee that they will open: whether any particular one opens is still randomly determined each time you approach that area). Note that several Main Quests reset this variable. y is a number between 0 and 100, and provides the percent probability that a gate opens when you enter that cell. Setting y to 0 will prevent any new random gates from opening. Setting y to 100 will guarantee that a gate will open when you enter the cell (provided that the total number of opened gates is less than MQ00.MaxOpenGates). Normally, y will range from 0 to 50, depending upon where you are in the Main Quest. Note that this variable is reset by several quests. z can be 0 or 1. Normally it is set to 0 (i.e., gates will not reopen, despite what the game guide says). If you set z to 1, it becomes possible for a new random gate to open in a location where you had previously closed the gate (including Kvatch). The chance of a gate reopening is controlled by the MQ00.RandomGateChance variable. This page was last modified on 17 October 2018, at 20:17.